The blood glucose test is a simple finger-prick test, advocated for men and women over 40. It determines the amount of glucose in the blood, primarily to establish whether you have diabetes (type 1 or 2), or are in early stages of the disease. A random glucose reading of 6.5mmol/l, or below, is within the acceptable range. Unchecked diabetes can lead to health problems such as heart disease, stroke, kidney damage, neuropathy and poor circulation. Checked early, the condition can be treated and managed through diet and lifestyle interventions, or prescription medication. 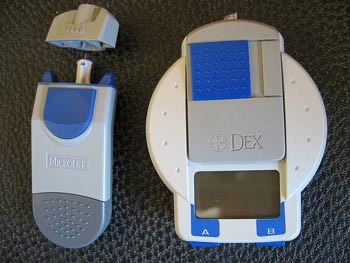 Modern glucometer for measuring blood glucose level, with skin puncture needle seen to the left.